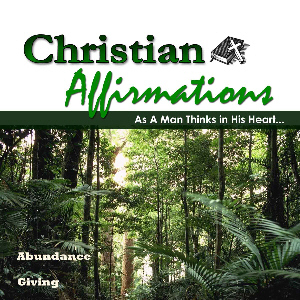 The Abundance & Giving Christian Affirmation CD contains Christian affirmations on ABUNDANCE and GIVING. Each recording includes an introduction, optional relaxation exercise, and two sets of affirmations and scriptures read to uplifting music. Play affirmations while driving, working, cleaning, and relaxing. * God is my source and constant supply. * God has blessed all the works of my hands.